The harissa-crusted lamb is roasted, then cut into thick, steak-like slices. If you like your meat well done, after carving rub each slice with olive oil, then chargrill as you would a sirloin steak. Any left-overs can be reheated in this way. My houmous contains no tahini or sesame paste, but you can add some to make the chickpea mixture richer, if liked. Preheat the oven to 220°C, gas mark 7. Slash the meat on both sides. In a small bowl, combine the salt, pepper, onion paste, two crushed garlic cloves, the harissa paste and the olive oil. Massage the harissa mixture all over the meat. Turn skin-side down and place in a large roasting tray. Place on the top shelf of the oven and roast for 20 minutes. Turn the meat over and roast for a further 20 minutes. Leave to rest, loosely covered with foil, for 10 minutes. Make the houmous put the chickpeas, lemon thyme, remaining garlic, the cumin, lemon juice and salt and pepper in a processor and process to a coarse paste. With the motor running, slowly add the olive oil through the feed tube until you have a smooth paste. Preheat the grill to hot and toast the pitta breads, then split. Slice the lamb into steaks. 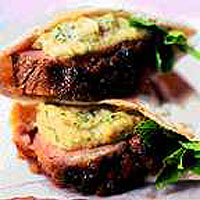 Fill the pitta breads with the meat, houmous and herbs.